Booby and the Beast: What is Team Booby and the Beast All About, Anyway? What is Team Booby and the Beast All About, Anyway? Today is a chemo day for me. This means I take Quinn to school, try to get in a workout because I know I won't be feeling up for one for another few days, have a little lunch, and then drive to the infusion center about half an hour away from my house. Kathy or Wes will gather my vitals: weight, blood pressure, heart rate and oxygen levels, and temperature. Then I'll choose which recliner to sit in and wait for a nurse. Nickole or Angela will access my port as we chat about what we've been up to the past three weeks; mostly, we talk about our kids. "Take a deep breath," one says as she swabs the raised area on my chest with an alcohol pad. "Okay, now exhale," and I do, as a needle goes in and she takes a few vials of blood to test my blood counts, my electrolytes, my liver enzymes, my tumor markers. Mostly, my labs look good. Then they hook me up to the infusion of pre-meds. I get anti-nausea drugs and steroids. By the time these are finished, I've been at the center about an hour. Then chemo starts. It doesn't feel any different. It takes about thirty minutes. Afterward, they monitor me for another thirty minutes to make sure I don't have any adverse reactions. A week later, I have to return for more blood work, just to make sure I still have enough platelets, still have enough white blood cells, still am not anemic. Mostly, I'm okay. My routine has been exactly the same, every third Monday and then again the next week, for nearly two years. 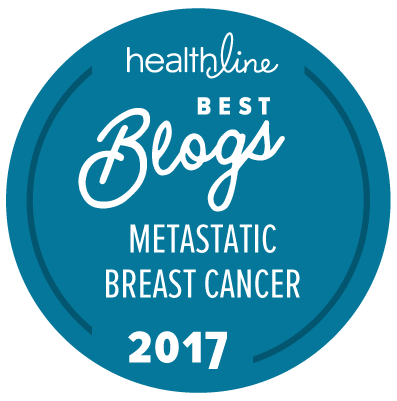 I've been visiting this infusion center at least as often for three and a half years, since I was first diagnosed with metastatic breast cancer in August 2011. I know how lucky I am to have the care I do. I am lucky that my infusion center visits only take a couple of hours (plus driving time), that I am able to drive myself to treatment, that my insurance pays for nearly everything, that I have a dear friend who comes to visit with me most treatment days, that my nurses know me and my family and take an interest in our lives, that my treatment is working. I could go on and on. I am so, so lucky. Not everyone has these luxuries. Too many people don't have ready access to quality healthcare. It's too far to drive or too expensive, or the medicine doesn't work because we still need more answers about more types of breast cancer. I know too many people who've died because of this disease, and many, many more who are hoping their next chemo combination will work so they can have a few more months (or, God-willing, years) with their loved ones. If you've been following my blog for a little while now, you know I've been walking in the Avon Walk for Breast Cancer since 2012. I was bald that first walk and in the middle of some intense treatment, but Avon asked me to be the Survivor Speaker at the opening and closing ceremonies. I'd never spoken in front of 3,000 people before, but that crowd of people gave me courage. As I crossed the finish line that year, holding hands with my unofficial teammates Ginelle, JT, and Sheryl, I was overcome by such a rush of emotion that I immediately signed up for another walk in 2013. And then another. Why Team Booby & the Beast? 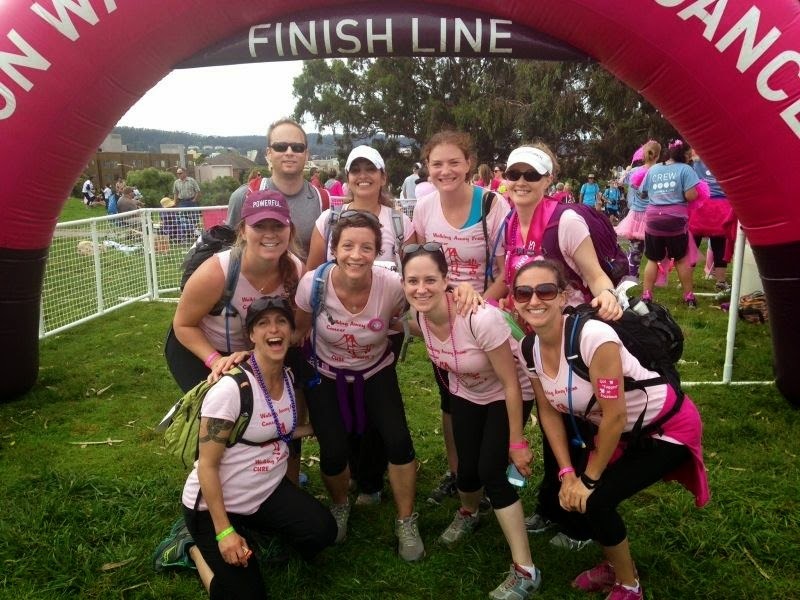 Last year, the three women who walked with me and I decided to form a team, Team Booby and the Beast, which allows us to fundraise together or individually. Mostly, though, it is a way to show our solidarity with one another, to stand and walk and cross finish lines against this disease as a unit. This year, SIXTEEN of us are on this team: Alana, Amy, Beth, Beth, Daurie, Ginelle, Ginger, Gretchen, Jess, Jessica, Kacey, Leslie, Nora, Rashmi, Shelby, and myself. We have already raised more than $20,000. We are aiming for $50,000. We will all walk more than 39 miles over the first weekend of May in Washington, DC. We will probably wear obnoxious amounts of pink and undoubtedly there will be signs cheering us on that say things like: "Save the Tatas." I will want to remind those people that it's not about tatas, it's about lives but I won't say anything because after all they're cheering us on on a Saturday when they could be running errands at Costco. Undoubtedly, some people will walk for a mom or sister they've just lost, and I will start crying, right there on the trail, when I see the emotion on their faces. Most likely, the volunteer who hands out shirts at the end of the walk will be surprised when I ask for a survivor shirt. "You're too young!" she'll say, and I'll think I wish. I will be reminded over and over again how lucky I am. I was recently asked if my fundraising was to help with my personal medical expenses. It is not. I am remarkably, unquestionably fortunate in that regard. I thank my lucky stars every single day. My husband's job at Arizona State University provides us with exceptional healthcare benefits, and our out-of-pocket expenses over the last few years have been relatively minimal. Even after I had to leave my career as a lawyer, even given the loss of my income and the inconvenience/nightmare (depending on who you ask) about how we would repay my student loans, we are okay. We don't always repair what needs repairing in our house right away, but we have a house. In a safe neighborhood. We have two cars and a garage to park them in. Our cupboards are full. I can afford to take Quinn to school while I get treatment. This is no small thing. We also have a strong community of friends and family who've stepped in over and over and over again to support us as we coped with the shock of my diagnosis, navigated less daycare/preschool after I left my job, my ongoing treatment, and a surprise surgery while Chris was on his way to a conference in Tennessee so that he can keep his job and we can keep our healthcare. So I walk because I owe it to the Universe. I'm not trying to be trite or flippant. I walk because I have been luckier than I ever could have imagined, and this is the best way I know how to give back right now. I walk to help women who are not as fortunate, to raise money for research funds -- for a cure someday, yes, but also for more advancements where they're terribly needed right now, so that more women can have more years with the ones they love. So they can raise their children and love their spouses and drink a glass of wine with their best friends. So they can worry about work deadlines or meal planning or other minutiae instead of cancer and all its devastation. There are many walks/runs that support breast cancer research and education. I chose Avon because of their commitment to funding care for women who wouldn't otherwise have it. Because they give millions of dollars in grants to research. And because they didn't shy away from featuring my story of living with Stage 4 breast cancer; instead, they asked me to tell it to 3,000 people while I shared a stage with Fergie. 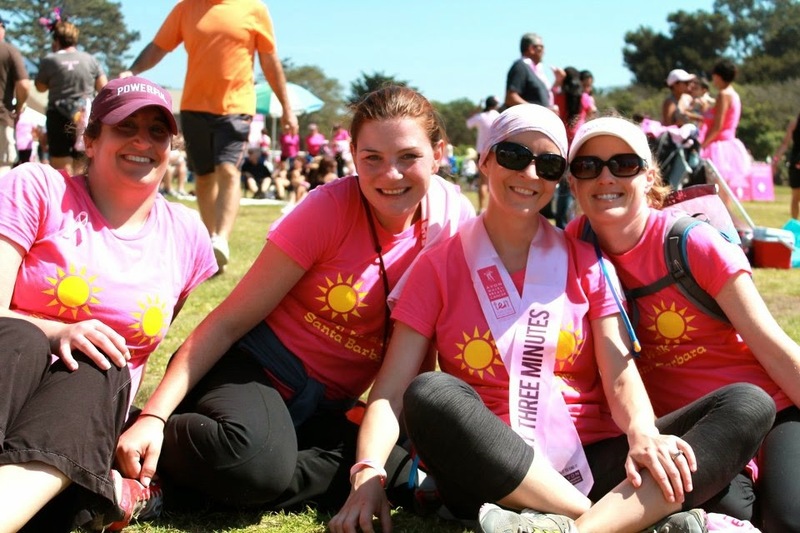 Since 2003, the Avon Foundation for Women has organized several walks each year in select cities around the country. The money raised funds local research facilities, services for women in underserved communities (including screening and treatment), and provides support for the families of those affected by breast cancer. In Washington, DC, grants have been awarded to recipients that include the Johns Hopkins University (my alma mater), the Capital Breast Care Center, and Food & Friends, which provides meals, groceries, and nutrition counseling to people living with life-threatening illnesses such as cancer. I know this has been the longest post ever, but this is important to me. It's my little tiny way of paying it forward. If you'd like to support me or my Team, you can click here, or stay posted for details on an upcoming fundraiser in the Phoenix/Scottsdale area this spring which will be headlined by my friend Jenn, a woman and friend whose generous spirit I strive to emulate. Stay tuned. And thank you. I couldn't do any of this without you all, and I love you all for it. Thank you for this post and for all you do to help others who don't have the same access to good care. I hate that you need the care that you are getting, but I am very glad you are getting it. Kudos to you and your team. Thanks, dear one. It's a hard balance, sometimes, between wanting to give back / pay it forward and wanting every last penny to go to research so we can all stop dealing with this eventually. One way or another, I hope I'm making things a little better in this world. Thank you for the post Jennifer - you do a great job articulating what it is all about and why it is important. I, too, am doing the Avon walk, but for the first time this year - in San Francisco. I just setup my team because I have a relative from Canada that is flying down to walk with me ... as I read your post I found myself agreeing with so many of the reasons you walk. Hope your walk goes well this year! Enjoy your first walk, Becky! The San Francisco walk is so beautiful. Please let me know how it goes for you. Every bit does count -- thank you! And yes, using my anxious energy (so perfectly put) toward something other than worrying about my own health is very helpful. One more reason why I walk: it's therapeutic!